Confirm programming and assessments that accommodate the ways gifted youth with diverse sexual orientations and gender identities display intellectual, academic, creative, artistic, and leadership excellence. (Friedrichs, 2012; Friedrichs, Manzella, & Seney; 2017; Treat, 2008; Whittenburg & Treat, 2009). Ensure that curriculum, including curriculum for gifted youth, includes positive examples of individuals with diverse sexual orientations and gender identities (National Association for Gifted Children, 2015; Treat, 2008; Whittenburg & Treat, 2009). Incorporate LGBTQ issues as a natural part of classroom conversations (Sedillo, 2016; Whittenburg & Treat, 2009). However, refrain from using an “out” gifted LGBTQ student to act as a spokesperson for gay-rights issues in the classroom, Though the student may be informed on the topic, he or she might not be comfortable being the voice for LGBTQ students in class or on campus (Keener, 2013). Provide academic programming that empowers these students to develop their unique learning potential and interests. Include sexual-minorities in the standard curriculum and whole-classroom discussions of sexual-minority topics (National Association for Gifted Children, 2015; Peterson & Richar, 2000; Whittenburg & Treat, 2009). Understand that home/residence issues (not out at home, abusive family members, homelessness, economic/logistical challenges) may make attending class difficult, creating the need for tailored approaches to grading— including options that may not penalize for absences (Manzella, 2014; Sedillo, 2013). Ensure that career education avoids stereotypes and encourages LGBTQ students to consider careers that are appropriate for their talents and interests (NAGC, 2015; Whittenburg & Treat, 2009). Check that non-traditional gender roles are honored and included in classroom discussions and in curricula (Sedillo, 2016). Provide college counseling that contain universities supportive of sexual-minority youth (Friedrichs, 2012). 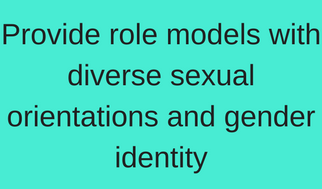 Include positive role models in gifted education—experts and community members who have diverse sexual orientations and gender identities (e.g., guest speakers, mentors, job shadowing, internships with culturally-sensitive mentors, etc.) (NAGC, 2015; Sedillo, 2013; Whittenburg & Treat, 2009). Verify programming efforts address a range of academic, social-emotional, and career needs related to the healthy, affirming development of gifted students with diverse sexual orientations and gender identities, including provisions for student safety, acceptance and appreciation of these students, and development of self-advocacy abilities in these students and for those with same-gender parents (NAGC; 2015; Pearson, Muller, & Wilkinson, 2007). Use gender-neutral language in school correspondence and documentation that respects diverse sexual orientations and gender identities of parents/guardians, educators, and students (NAGC, 2015; Sedillo, 2016; Whittenburg & Treat, 2009). Work toward safe schools/safe zones to protect and nurture the unique sensitivities of Gifted LGBTQ youth (NAGC, 2015; Sedillo, 2016). Provide opportunities to participate in Gay, Straight, Alliance / Queer, Straight, Alliance (GSAs/QSAs) (Sedillo, 2013; Whittenburg & Treat, 2009). Develop policies to accommodate gender expression that may not conform to social stereotypes (Sedillo, 2016; Whittenburg & Treat, 2009). Help families nurture LGBTQ students’ special strengths, healthy social and emotional development, and self-advocacy skills for both in and out of school (NAGC, 2015; Sedillo, 2013, 2016). Ally yourself with LGBTQ students. Visible support and small acts of kindness can do a lot to help these students feel safer, less lonely, and worthy of respect and kindness (Southern Poverty Law Review, 2017).